Cash-strapped consumers are skipping healthier options in favour of the affordable indulgence offered by premium crisp brands. As the mood of austerity leads more people to stay home to save money - and more than half of consumers say they have cut back on nights out - these lifestyle changes hinder some brands but benefit others. Those categories that satisfy people's desire for an affordable luxury can do well. 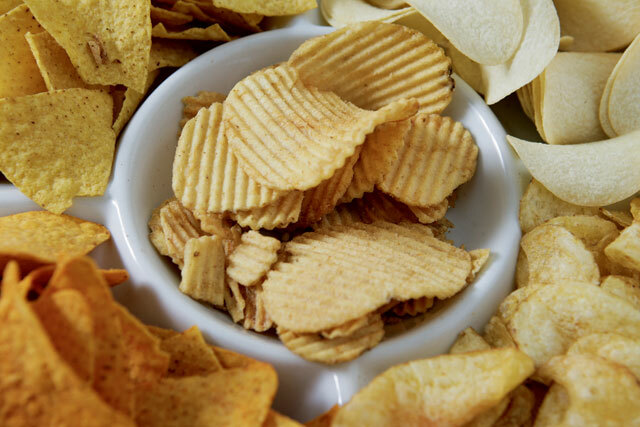 Some foods, such as crisps and salty snacks, have benefited - the premium end, aimed at the sharing market, in particular, has proved a favourite accompaniment when enjoying a drink at home. 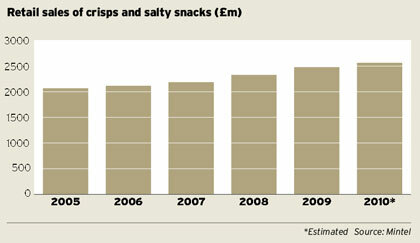 Nonetheless, the crisps and salty snacks sector has encountered erratic growth over the past few years. Overall sales have increased 24% since 2005 to reach an estimated £2.6bn in 2010, according to Mintel. While sales increased rapidly in 2008 and 2009, they slowed in 2010. This sector falls into the category of foods high in fat, salt and sugar (HFSS) that has been subject to government advertising restrictions. With obesity levels among adults and children still a major health concern, it is unlikely that this pressure on HFSS food manufacturers will ease. 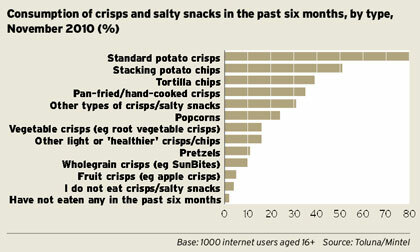 However, there has been a fall in the consumption of 'healthier' crisps, while the premium segment has performed well. Brands such as Kettle Chips - the market leader among premium brands - and Red Sky have used provenance and natural ingredients in their positioning to carve out authentic brand propositions. So it would seem that consumers are paying little heed to the government's healthier-eating messages where crisps are concerned; perhaps taking the attitude that if they are going to eat crisps, they may as well buy the ones they like most. Also, the desire for affordable, comforting treats may rise, as people have to cut back in other areas of their lives. If the healthier-eating message is having an impact, it appears to be on how often people buy the products: while 84% of adults eat crisps and snacks, the frequency is declining, according to TGI. Brands dominate the sector, with own-label accounting for only about 20% of crisp sales. NPD is prevalent among the brands; last year the most-common claims centred on products' vegetarian credentials and being free from artificial additives or preservatives. While spicier and more ethnic flavours have been introduced to the market, the traditional flavours, such as ready salted and cheese and onion, remain the most popular. PepsiCo dominates the sector with brands including Walkers, Doritos and Monster Munch. 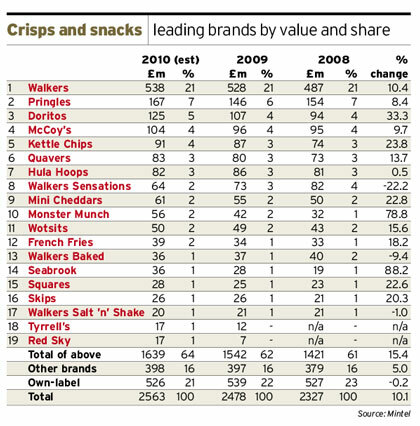 Walkers remains the leading light among crisp brands in terms of share. However, its Sensations and Baked sub-brands have had a rockier ride than the core brand in recent years. Walkers is also working to remove all artificial flavour enhancers, preservatives and colours from its crisps by 2012 as the latest phase of its commitment to produce healthier products. Other companies in this market include United Biscuits, which owns the Phileas Fogg, McCoy's, Hula Hoops and Mini Cheddars brands; Procter & Gamble's Pringles; Tyrrell's; and Seabrook. The latter, based in Bradford, is a well-established brand in the North and has been extending its distribution network, building nationwide share with listings in major supermarkets. Snacking is a popular part of British food culture. 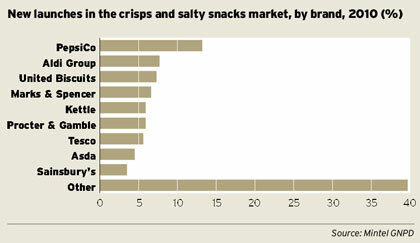 The only foods rated more popular than crisps as snacks are fresh fruit and chocolate bars. Those buying crisps and salty snacks in the biggest volumes are households with children aged five to 15, while the over-55s are the least interested. The restrictions on HFSS foods in schools mean children's snacks have come under pressure. While eating crisps in schools has declined as a consequence, consuming them on the move or outside schools has risen. With the number of ABs set to increase and the possibility of a corresponding rise in sales of premium crisps, the sector will reach a predicted value of £3.1bn by 2015, according to Mintel. This is a rise of 21%, although, when inflation is taken into account, it means the market will have remained almost static over the next five years.